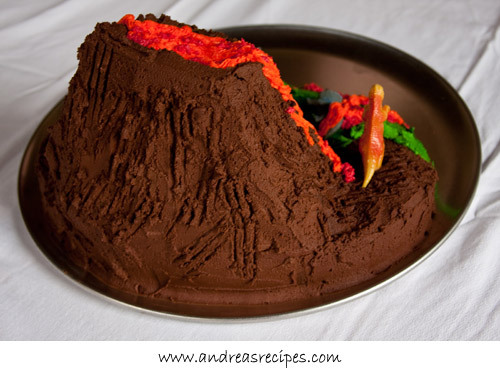 For Top Gun’s fifth birthday, he requested a volcano birthday cake with dinosaurs. 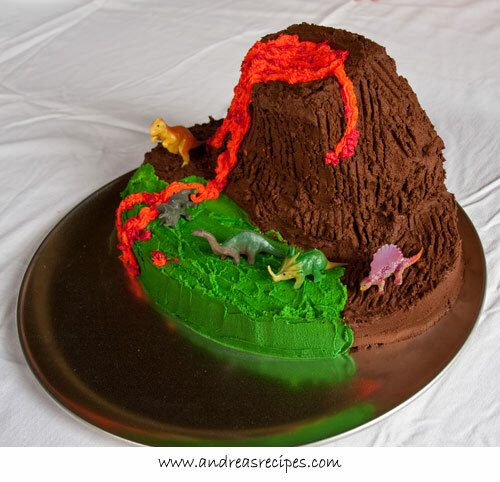 For some reason, he associates volcanoes with dinosaurs, so we obliged and made a chocolate volcano birthday cake with chocolate frosting and colored vanilla frosting with five toy dinosaurs—one for each year—strategically placed on top, making a sort of volcano diorama. He was so excited when he came home from school and found the cake sitting in the kitchen, though he felt we had not included enough dinosaurs in the diorama, so he ran upstairs and pulled another from his collection and plopped it down exactly where he thought it should go. Top Gun had a big happy smile when we brought the cake in and let him blow out his candles, which we placed in the cone of the volcano. As we started serving, Grandma asked him, “Would you like a piece of birthday cake and some ice cream?” My precocious five-year-old responded, “Yes, that would be lovely.” I know exactly where he has heard that (me). As with the Little Einsteins Rocket Cake, we used two Wilton oval cake pans—one larger than the other—from the Wilton four-piece oval set. You can find it at Michaels or A.C. Moore, and we used one of their 40% off coupons to save money on the set. We like using these pans because the cake starts out roughly in the shape we want, but you could also use two 9×13 pans. The larger oval served as the base and we cut up the smaller oval into three pieces and stacked them to form the volcano. We weren’t exactly worried about being precise since volcanoes should have a rough appearance. It kind of tilted forward, so we used a cut off chopstick to stabilize it, then we shaved off some of the cake and arranged it around the top layer to form the cone where a pool of molten lava frosting would sit, and later where we would place the candles. This is one of the easier birthday cakes we have made, taking just two hours to decorate. Volcanoes have rough, rocky surfaces and since we were shooting for some semblance of authenticity, rolling fondant was out and scraping chocolate buttercream with a fork like Richard Dreyfuss with his mashed potatoes was in. 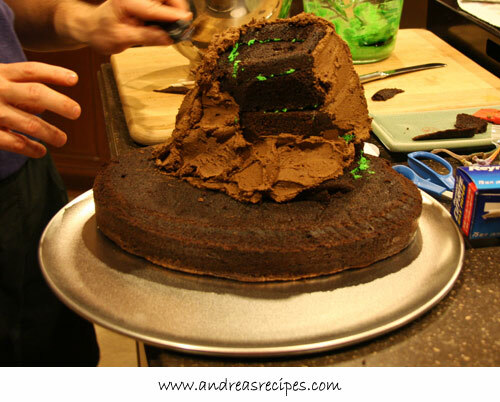 We decided to go with a tropical volcano theme with some green at the base of the volcano, but you could certainly go with an all-chocolate desolate look, too, making piles of frosting here and there to create a rocky surface. The cake was tall and didn’t fit in the refrigerator, so using pure buttercream that would loosen and run down the sides in hot humid weather was out. For the frostings we used Wilton’s recipes for vanilla and chocolate buttercream, which uses some shortening. The shortening helps to stabilize the frosting, important for hot humid weather if you cannot refrigerate the cake. If the weather is cool or the cake can fit into your refrigerator, go for pure vanilla buttercream and the pure chocolate buttercream recipe included below, they are so delicious. We used melted Ghirardelli 100% cacao baking chocolate, which gave the chocolate frosting a rich flavor. 2 to 4 tablespoons cold milk (Depends on humidity and whether you chose the melted chocolate or cocoa powder. 1. In the bowl of the stand mixer at medium speed, cream together the shortening and butter until smooth. 2. Add the vanilla extract and melted chocolate and stir until thoroughly combined. 3. Add the sifted confectioners sugar, one cup at a time, scraping down the bowl between each addition. 4. Add the milk one tablespoon at a time, just until the frosting is creamy, not runny. You may not need all the milk. Whip at medium speed for about 1 minute to combine all the ingredients thoroughly. 5. Use promptly or refrigerated with plastic wrap pressed onto the surface. Allow to come to room temperature and whip again before using. 1. Stir together the melted chocolate, vanilla, and salt in a bowl until the salt dissolves. 2. In a stand mixer with paddle attachments, beat the butter until it is smooth, about 30 to 60 seconds. In a bowl, whisk together the confectioners sugar and cocoa powder. Reduce the mixer speed to low, then slowly add to the butter, beating until smooth, 2 to 5 minutes. 3. Beat in the melted chocolate mixture. Increase speed to medium-high and beat until fluffy, 4 to 8 minutes. Make the vanilla frosting recipe. Set aside approximately 1/4 cup, then divide the remaining frosting into two equal parts. Tint the two larger portions green and orange and the smaller portion red. 1. Place the large cake on the serving platter. Cut the smaller cake into three roughly oval shaped chunks. 2. 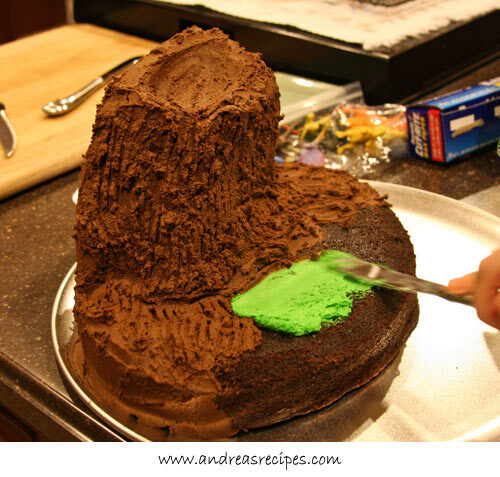 Use some of the frosting, whichever flavor or color you choose, to anchor the volcano layers to the base. (We used green so it would show up in the photos.) 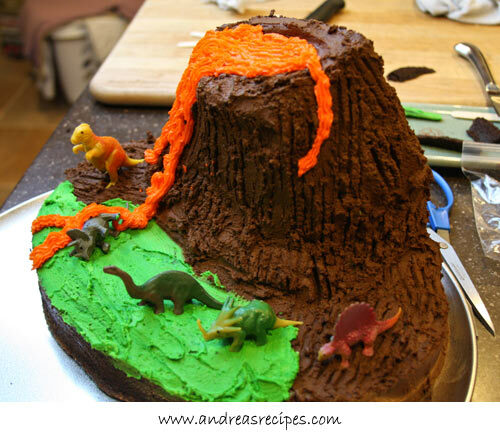 Use the serrated knife to shape and form the volcano and base to your liking. 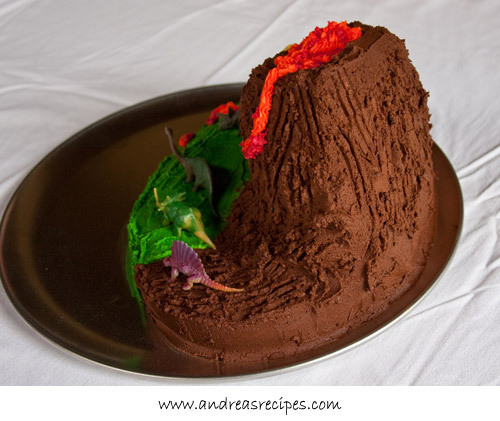 We used some of the shaved cake pieces to create a cone at the top of the volcano by piling them around the edge. 3. Spread the chocolate frosting around the volcano, bringing it up and over the lip of the cone, and around parts of the base. The frosting doesn’t have to be neat, this is a rocky, craggy volcano after all. 4. Scrape the chocolate frosting with a fork to create texture. 5. 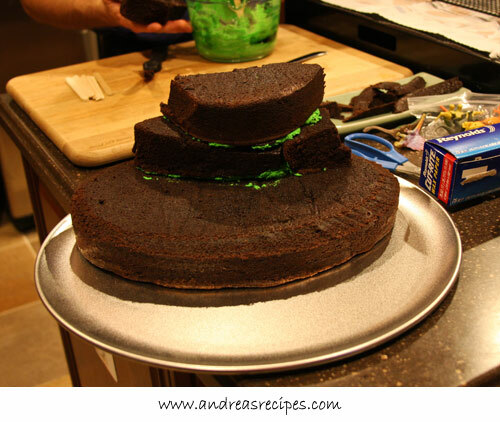 Begin spreading the green frosting around the rest of the base. Again, we didn’t go for smooth, wanted it to give the impression of tropical undergrowth. 6. Prepare one piping bag with orange frosting using the #16 tip. 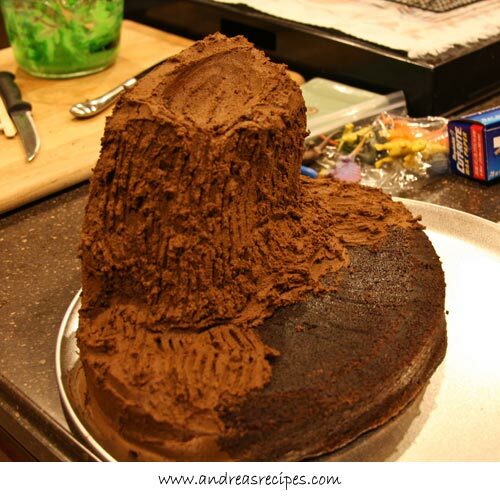 Pipe the frosting (lava) into the cone and down the sides in whatever pattern and direction you like. Michael decided to take out one of the dinosaurs with the orange lava. Add some red lava frosting by dipping the toothpick into the frosting and just twisting it on top of the orange here and there. 7. Change the orange frosting tip to the #3. Pipe Happy Birthday and the child’s name on the open area on the platter/baking sheet. Place candles in the volcano cone’s pool of lava. What a great cake! It looks like a little boy’s dream! I’ll have to remember this one for my 7 year-old nephews’ next birthday. What an awsome cake for the birthday boy…I bet his eyes really got huge when he saw it for the first time! You’re a great mom creating wonderful memeories for him. .-= Lynda´s last blog ..Red Skinned Potato Salad and some Garden Pictures =-. Wow. It turned out great. I love making and decorating creative cakes, but sometimes I need a little inspiration. I love the 3-D ideas. 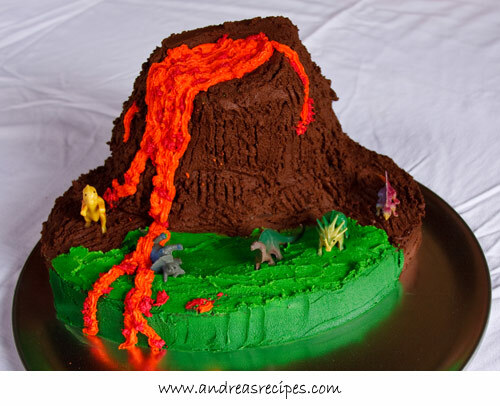 My son just requested a Pokemon cake for his birthday, but I like the volcano idea better. Pokemon around a volcano?? LOL 🙂 Thanks for all the detailed instructions. .-= Heather @CeliacFamily´s last blog ..Menu Plan June 15 =-. That looks great! So funny about Close Encounters! That looks great! I love how it turned out. Very nice! Alexis wants a penguin cake for her party next week. I think I’m going to do an ice shelf with an igloo (even though that’s not realistic) and then I have some penguin figurines to put on the cake. I had though about doing fondant or marzipan penguins, but I figured it would drive me batty so when I found the little figurines I jumped at them! .-= Dianne´s last blog ..Parmesan and Onion Potatoes =-. As usual, an adorable birthday cake! Wish we could have been there to celebrate with you guys. 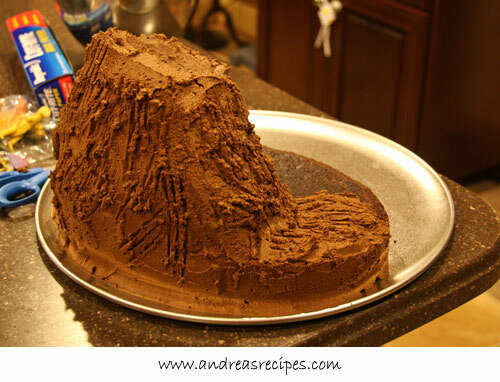 Great walk-through for a kids birthday cake or just as a tasty activity for the whole family. The dinosaurs are cute too!